The term “private water” doesn’t refer to the water itself, of course; private water means the banks surrounding the water are private land. Piney Valley Ranch is part of Swedish shipping magnate Magnus Lindholm’s Piney Valley Land Trust, and recently the area was only available on a membership basis, with a fee that would make many private country clubs a bargain by comparison. 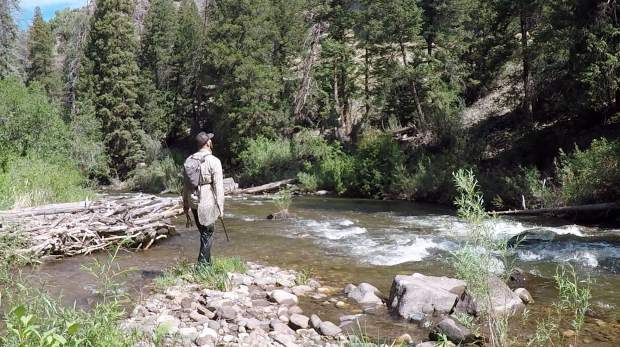 While the river is teeming with large trout, it has not been available for commercial fishing in recent years, but Sage was able to lease the land this year, and an exploration of the property began immediately by Sage employees Sky Young and Joe Tomasic. What they found blew their minds. While there aren’t many anglers who have fished Piney River, many are familiar with its source, Piney Lake near Vail. The river flows from the high-alpine lake into the ranch, where a healthy riparian area keeps much of it shaded and cool. On Friday, July 13, Tomasic said they had not seen temperatures exceed 64 degrees yet this summer, and during most parts of the day, the temperatures are in the high 50s to low 60s. Getting to the water is an adventure in itself. Sage takes you on a tour of the property using a side-by-side utility terrain vehicle, until the terrain becomes too rugged for the machines. Singletrack hiking trails provide access to some of the more remote sections of the river; however, there are also plenty of sections where the vehicle will take you right up to the riverbanks. For large groups looking to have a quiet afternoon all to themselves, Sage’s Piney Valley trip offers an excursion that can cater to patrons from all levels of mobility. This story has been corrected to reflect the fact that commercial fishing has taken place on Piney River in years past.